The one place I can recommend for this is Sheet Music Plus. There, you can find everything for oboe that you could possibly need. Depending on the piece, you can choose between editions, and everything is done through the convenience of your own computer in your own home. They claim to be the world’s largest selection of sheet music. They do seem to have just about everything. Their shipping is fast, and they have a no hassle return policy. It is worth checking out. To save you some time, here are some links to find some of the standard method books, oboe sonatas and oboe concertos. Oboe orchestral repertoire music has a wonderful new resource called The Orchestra Musician’s CD-ROM Library. 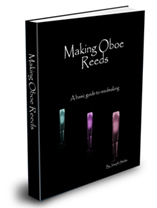 Music for oboe with cd accompaniment is a wonderful tool to use. I have compiled a rather large list of Music Minus One, and other titles for oboe with cd accompaniment. If you are in a hurry, and want to look for a specific piece, or some other piece of sheet music, here is search box to go directly to their site. To start your search, just fill in the box.